Tempuss is no ordinary cat. He is the Last Timebender, possessing the power to control time itself. On a quest to understand the true strength of his power, he must explore the various decks of the Tempus Fugit spacecraft. This puzzle-platformer will have you both planning and reacting as you attempt to make it through 10 levels. A & D - Movement. S - Sit (Regenerate). L-SHIFT - Sprint. MOUSEWHEEL - Control Global Time. LEFT-CLICK: Speed Up Local Time. RIGHT-CLICK: Slow Down Local Time. 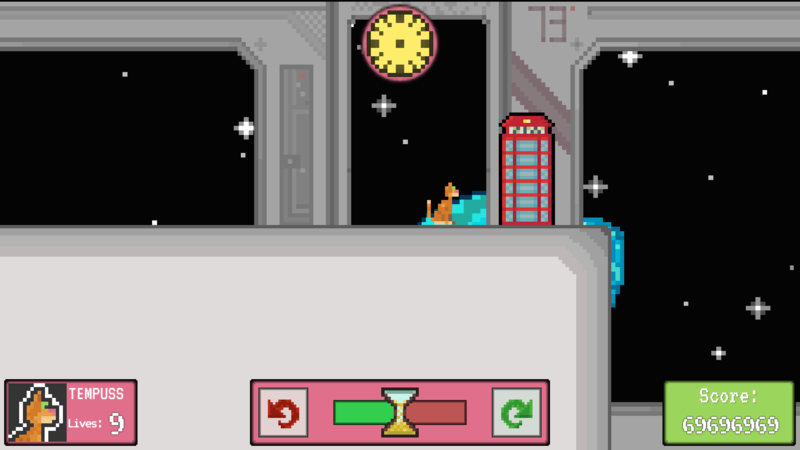 You are able to manipulate not only global time (that affects everything including you), or manipulate local time of objects like moving platforms and laser beam cannons. You sit (S) in order to regenerate your timebending resource. I love you and sorry for the delay on submitting the game. Wow. This game feels so polished. I just can't believe you've done something like this in such a short space of time. The animations are superb, and I love the parallax effect on the backgrounds. The concept fits perfectly with the theme, and the concepts of the game are really well explored. My suggestions are more just small quality-of-life improvements. 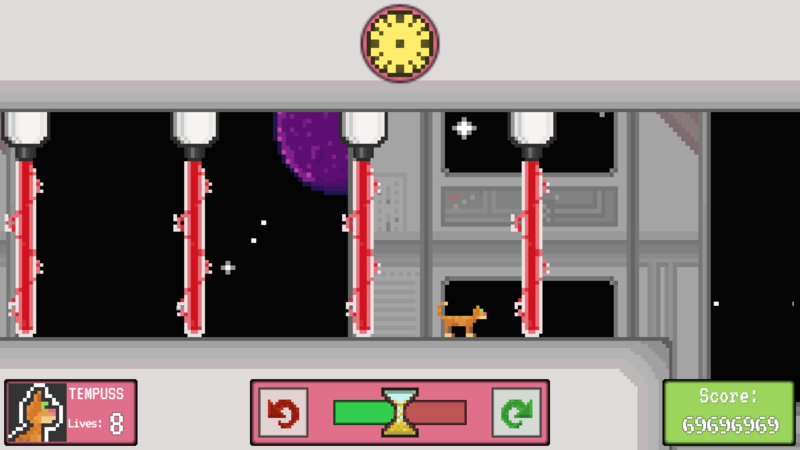 While the "9 lives" idea is funny at first, it's not so fun when you have to start at the very beginning, going through all the tutorial stages again. Especially when a couple of deaths feel quite cheap, and the overall difficulty spikes nearer the end. I would love just a couple more keyboard bindings as well. Have two keys to the slow/moving time would be good, and possibly a key to reset the time of all the objects. This isn't really game related, but a slightly higher-resolution thumbnail might help the game stand out better. This was one of the last games I got to, and I think it's because the thumbnail blurred in with the rest. On the whole though, I'm in awe of just how much you've managed to do in a short space of time. This is truly one of the best games in the jam. Thanks so much for taking the time to write your feedback! I should have made it more obvious - there is a button called "EZ MODE" on the title screen that gives 99 lives instead of 9. That was made for the streamers etc, but you got a point. I agree about the frustration of starting over and doing all the tutorials again. A level select would maybe have been a better idea. Thanks again, really appreciate the comments you wrote. Oh right. I didn't see that. Great stream BTW! Great great great jobbbb dude. I'm in love with the cat. The pixel art was really what caught my eyes, and I learned a lot from it. The gameplay and mechanics are well-done and polished. Hey Dan, just finished playing your game, and I'll leave some feedback if you don't mind! 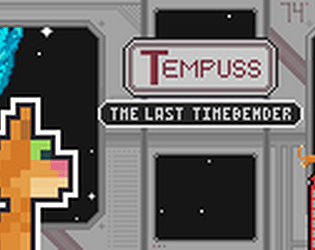 The game is very short, but that's OK: the mechanic of timebending is well explored, and the level design is good, requiring the player to get better and better at using Tempuss powers (nice pun by the way). Also by being short, the mechanic never starts to feel really repetitive. And most importantly I would say, this game is fun as well! I would like to comment two things though, very minor stuff. The first is that you start with 99 lives, instead of nine: I think this is something you forget to change and was in there for debugging, maybe? 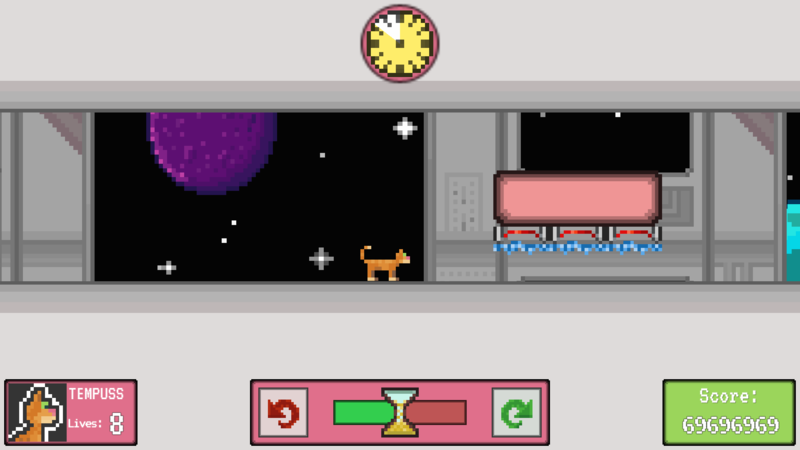 And second, the mechanic of slowing down individual objects is great, but the one with slowing down (or making faster) the entire world (the cat included) I used only when it was introduced. Maybe it would be nice to see both interacting, or the global change of time speed changed to be more interesting. Anyway, surely a good game! Thank you so much for the feedback! 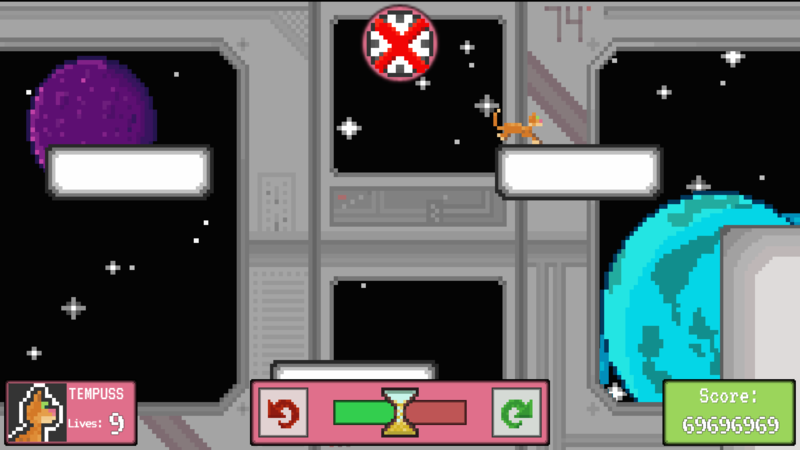 It is indeed short, unfortunately as this was a game jam game, I found myself with only 2 hours to create levels!! So I did my best but would have enjoyed more time. I agree that the slow down / speed up global thing doesn't seem as needed as the local one, however, the alternative was to have tempuss remain the same speed even during global. This however lost the fun element of having the high pitched meows or the slow mo jump through airs. From a mechanic point of view, it does need a bit of a rethink - and the implementation would likely need a rehaul to allow that!